Garshield is a cost effective method of growing crops in a sustainable way. Aston Garshield is a concentrated food grade extract of garlic supplemented with natural plant derived additives that should be used throughout growing the crop. Used as a foliar applied solution, Garshield promotes vigour and stimulates the plants natural processes to produce balanced healthy growth and encourages resistance to mildew and botrytis. Regular use has shown that plants resist bacterial, fungal and viral diseases. Garshield assists plants to resist the adverse effects of stress and damage caused by nematodes. Research at the University of Arkansas USA has shown that a garlic solution of 10% (v/v) inhibited mycelial growth of Pythium spp., Phytophthora spp., Rhizoctonia spp., Fusarium spp. and Verticillium spp. proving to be fungistatic in viticulture. Research has also shown anti-fungal activity against Botrytis cinerea, Alternaria brassicicola and other pathogenic fungi. Why Use Aston Garshield ? Regular use of Garshield will assist crops to produce good clean healthy root systems. 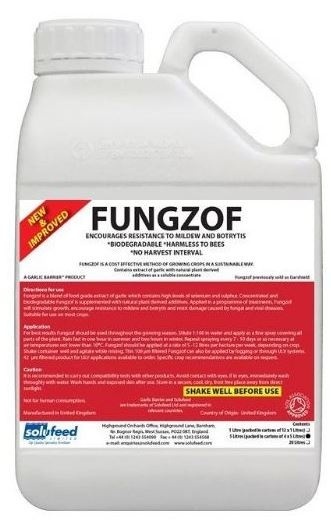 When used in a programme of treatments it will stimulate growth and promote healthy vigorous plants much more resistant to bacterial and fungal diseases. Garshield reduces the reliance on conventional pesticides, and therefore a reduction or elimination of pesticide residues in the resultant food, including tomatoes, cucumbers, lettuce, strawberries, and field grown crops. Dilute 1:100 in water and apply as a fine spray covering all parts of the plant, normally 500 litres/hectare for edible and ornamental crops, increasing to 1000-2000 litres/hectare for trained crops of cucumbers, peppers and tomatoes in glasshouses or other protected structures. Alternatively Garshield can be applied by fogging. Treatment should be repeated at 7 to 10 day intervals, at air temperatures not lower than 10°C. Shake container well and agitate while mixing. For sprinkler or drip irrigation to soil, substrate or through hydroponic systems, use Aston Anthyllis. Suitable for use on most crops. For specific crop recommendations contact your local distributor or Aston Horticulture Ltd.